A nonfiction picture book is just the perfect thing for a lazy afternoon, isn’t it? Even those industrious Ingalls girls, Laura and Mary, spent some time probably sprawled on the floor, looking at the animals in Pa’s “big green book,” The Wonders of the Animal World. I recall many hours from my own childhood of slowly turning pages, studying pictures in detail, skipping a few boring-looking parts, and pausing to read bits of text that seemed interesting. 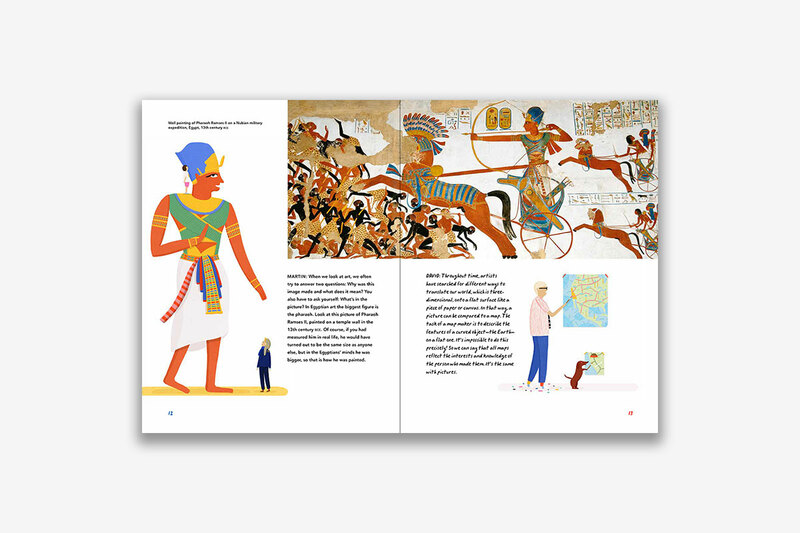 A great nonfiction picture book I stumbled upon recently and wanted to share here at Story Warren is an art book; not really your standard catalog of paintings and drawings, but one that frames significant works of art in history and looks into the methods and ideas behind art—just for kids! The book is David Hockney and Martin Gayford’s A History of Pictures for Children, and I had a wonderful time paging through it recently. It’s organized in a unique way that I think makes a lot of sense; instead of chronologically tracing the “history of art” (although there is a timeline in the back of the book), the chapters look at different methods of picture-making and how they came about and have developed through history. Titles of some of the brief chapters include “Making Marks,” “Mirrors and Reflections,” and “Printing and Photography.” My favorite pages are the ones about the Italian painter Caravaggio in the “Light and Shadows” chapter. I love that this book isn’t bogged down with explaining rules and conventions and trying to define “What is Art?.” I think kids reading this will be inspired and encouraged that there are and have been so many interesting ways to make art, rather than intimidated by the process. The final chapter looks at “what’s next,” and there’s a real sense of wonder in it, musing about what other methods for making pictures will emerge in the future. A final timeline of important picture-making inventions as well as a glossary are informative but keep things interesting and light. Budding artists, take note—it’s important to know where you came from, and A History of Pictures for Children is a fun jumping-off point.